THE outlawed Indigenous People of Biafra (IPOB) has appealed to the United Nations (UN) and the United Kingdom (UK) to prevail on the Federal Government to produce its Leader, Nnamdi Kanu, saying his whereabouts is unknown. 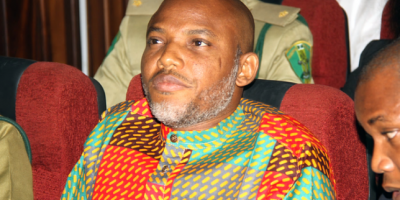 In a statement issued by the Media/National Publicity Secretary of IPOB, Emma Powerful, which was made available to Nigerian Tribune in Enugu on Wednesday, the group alleged, ?Nnamdi Kanu who incidentally holds British citizenship has been missing since a detachment of exclusively Northern Islamic officers stormed his residence on Thursday 14, September 2017. Mr Powerful further alleged, ?Ever since this brutal assault that left 28 dead inside his compound including two of his cousins, Mazi Nnamdi Kanu along with his parents His Royal Majesty Eze Sir Israel Kanu and Ugoeze Sally Nmeme Kanu have not been seen. The IPOB Spokesman stated, ?The video footage of the assault and the extent of destruction wreaked on his family home is in the public domain. Video clips and photographs of Mazi Nnamdi Kanu?s bedroom riddled with bullet holes from the guns of the Nigerian soldiers that stormed the palace is evident till today. According to him, ?The assailing soldiers also stole a lot of valuable materials from the palace of which we have corroborative evidence and incontrovertible proof that places the stolen items in the possession of Governor Okezie Ikpeazu, the newly appointed Abia State Commissioner of Police and other Nigerian security personnel. Due to the sensitive nature of this information, it will be made available to UN, British investigators and other reputable international investigators. The statement further read in parts: ?From inception of this genocidal Python Dance II against the Judeo-Christian populations of Biafraland by the Islamic Hausa/Fulani dominated Nigerian Army, many Biafrans have been killed by these rampaging soldiers, many more unlawfully detained and hundreds missing. ?What the world is witnessing is a well-orchestrated and premeditated mass slaughter of unarmed civilians with the consent of South East governors. That Umahi, Ikpeazu, Okorocha, Obiano and Ugwuanyi acquired the cover of Python Dance II to unleash state terrorism against unarmed people is an indictment of the predatory politics of survival Biafrans are now accustomed to. ?The deceptive lying Lai Mohammed can twist the facts all he likes but the fact remains that somebody somewhere ordered the unprovoked military invasion of Kanu?s house where hundreds of rounds of bullets were discharged and 28 people killed. These are facts that no amount of carefully choreographed performances and pronouncements by Buratai, Lai Mohammed and their stooges, the South East governors, can easily bury.